How efficacious is ustekinumab (UST) for induction and remission in moderate-to-severe Crohn’s disease (CD)? Ustekinumab is effective induction and maintenance therapy in Crohn’s disease irrespective of prior anti-TNF exposure. Adults diagnosed with CD (CDAI 220–450) and who failed anti-TNFs (UNITI-1) and/or failed immunosuppressant therapies (UNITI-2) were enrolled. Stable doses of immunosuppressants, mesalamine, antibiotics or prednisone (≤40 mg/d) or budesonide (≤9 mg/d) were continued throughout. Patients were randomized 1:1:1 to a single infusion of 130 mg UST or 6 mg UST per kg body weight, or placebo. The primary endpoint was clinical response at week 6 defined as a reduction of ≥100 points in the CDAI at baseline. 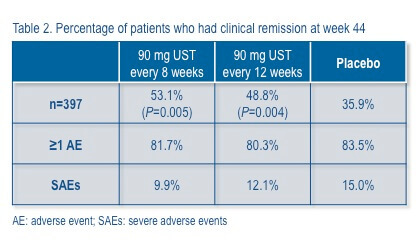 Patients who had a clinical response to UST by week 8 were randomized 1:1:1 to receive subcutaneous injections of 90 mg UST every 8 weeks or 12 weeks, or placebo. Oral glucocorticoids were tapered beginning at week 8. The primary endpoint was clinical remission (CDAI <150) at week 44.